Given the predicted 40 degree temperatures for Saturday, Saturday’s training is cancelled. I realize I overestimated how warm the weather would be. I think you would rather not freeze in order to participate! Please put Saturday, April 13th at 1pm on your calendar for the rescheduled training date. 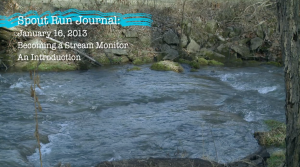 BOYCE — The C Spout Run organization is looking for volunteers to help monitor the health of the Shenandoah River tributary and chart the progress of restoration efforts. The classroom portion of a certification program will be held at 7 p.m. Tuesday in the Boyce Fire Hall. A one-day stream-side training class will take place in March. 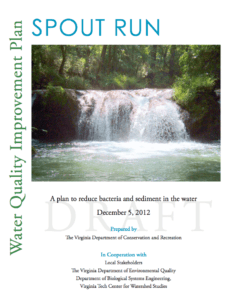 Spout Run and its tributaries Roseville Run and Page Brook have been declared “impaired” waterways by Virginia’s Depart- ment of Environmental Quality because of bacterial pollution and excessive sedimentation. Various local groups have banded together to clean up the streams. Sampling bottom-dwelling creatures is one way to measure stream health. 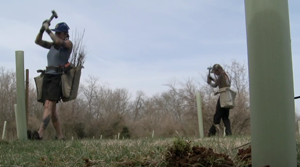 Volunteers are needed to get their feet wet, learn a new skill and help the watershed. Gem Bingol of the Piedmont Environmental Council will lead a free cer tification course in benthic macroinvertebrate testing, one way to monitor the health of streams by checking the types of aquatic species that live in them. Certified volunteers can help to gauge the ef fectiveness of the efforts to bring back the watershed by sampling the animal life at various points several times a year. This introductory session kicks off a new program to collect information about the benthic macroinvertebrates (small creatures that live on streambeds) in Clarke County streams. It will add to the valuable chemical data that the Friends of the Shenandoah River volunteers have been collecting for a long time. 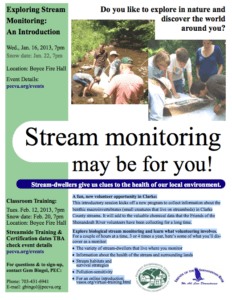 Explore biological stream monitoring and learn what volunteering involves.